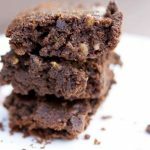 These clean eating freedom brownies are wonderful, grain free brownies!! A fan on facebook forwarded a recipe to me thinking I might enjoy a new type of brownie. A brownie made with coconut flour! Not being one to turn down a good brownie, I took a peek at the recipe. It looked lovely, and with butter, it would have been clean. But since I’m not eating any dairy at the moment, I had to make a change in the source of fat for these. And because I did that, I had to have more egg to help it bind. I also like a heavier vanilla flavor so….. well…. you get the idea. I changed the recipe. P.S. 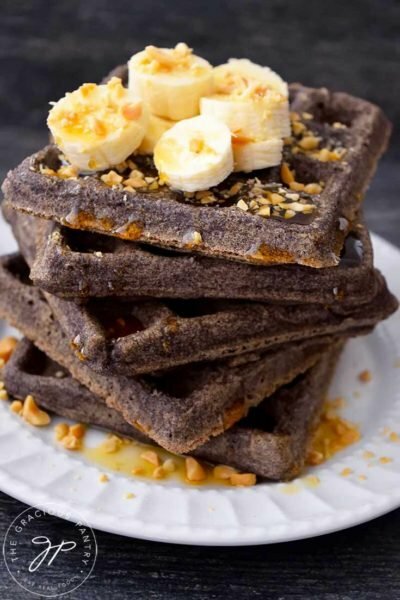 – These are gluten-free, dairy-free AND grain-free! Oh, and did I mention they are DA-ANG good!!???? But it’s also only fair to say that even though these are called “Freedom Brownies”, that doesn’t mean they are free of calories. These are definitely a once-in-a-while treat. 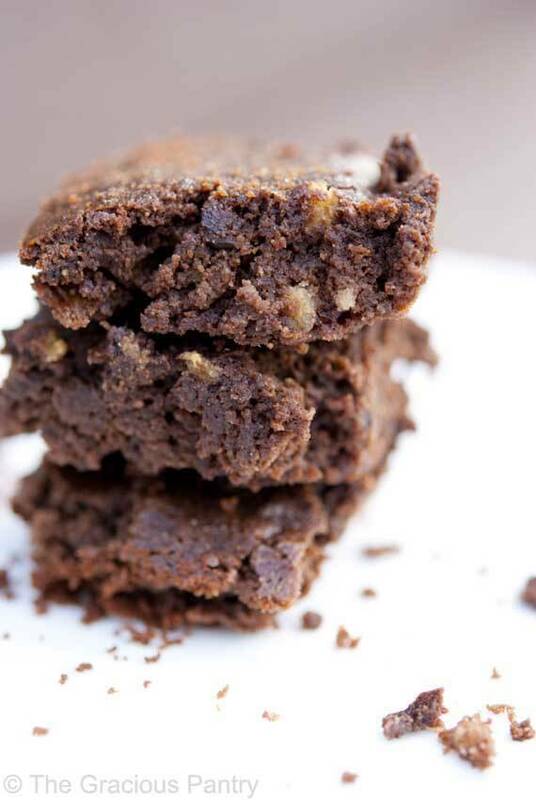 These delicious brownies are grain free and positively delicious! In a medium mixing bowl, whisk together the coconut flour and cocoa powder. Whisk in the coconut oil, eggs, maple syrup and vanilla extract. Blend well. Pour batter into a greased baking dish (mine was about 7x11), and bake at 350 F. for about 30 minutes. Allow to cool. This is important because they tend to fall apart easily when warm, making it difficult to get them out of the pan. 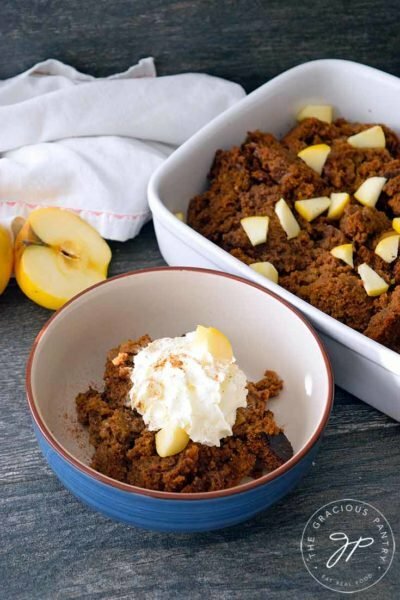 This recipe from the Gracious Pantry archives, originally posted 3/14/15. These look so moist, they will also be included in my Christmas Gift baskets for family and friends, I just wish I had this recipe earlier, Thanks for making my Christmas Baskets a lot cleaner! Wow thanks for this recipe I can’t wait to try these. Could you do this with 10 egg whites instead? My son has an egg yolk allergy. No. They come from a chicken. They are poultry. Sorry, but I really have no idea. You’d have to ask a dietitian. It’s pretty mild, actually. But then I’m used to putting coconut in everything. All I tasted was the chocolate. Tiffany, do you have any recipes using organic rice flour? Do you also have a clean eating recipe for empanada especially pumpkin ones?. Thank you love your site. Merry Christmas to your family. I have this recipe: https://www.thegraciouspantry.com/clean-eating-empanadas/, but it’s not pumpkin. And nothing with rice flour exclusively. Sorry! Thanks for your dedication and hard, if fun, work. I try a new recipe, if it flops the first time, I don’t want to try again! Now that I have a clean recipe for one of my favorite indulgences, brownies, I’m going to need for you to figure out for me how to do baklava!!! These look wonderful. Can’t wait to try this recipe. My husband has decided he wants to eat healthier maybe this is a good dessert option! making these with your oreo cookies for our xmas parties. My daughter has a dairy allergy so we appreciate these recipes. HI I made these for my grandmother who now has a gluten allergy. My whole family liked them. They were not super sweet, but good. They were very moist for me. Could be an altitude difference or even difference between our ovens. You can always add some apple sauce for moisture. 1/4 to 1/2 cup. I just took these out of the oven! Yum!! These will definitely get me through a tough sweet tooth craving! I did use an electric mixer for a minute or two and the batter was almost frothy. Brownies had enough moisture and really arent falling apart at all. Perfect! This recipe really is formulated for the use of these items. I have other brownie recipes that might work better for you. Do you melt the coconut oil? I made a similar recipe but it came out clumpy and not much of a batter. I ended up adding almond milk and it came out like a cake. Still delicious but not my intended outcome. You could certainly try it. I don’t use stevia so I’m not sure what the results would be. 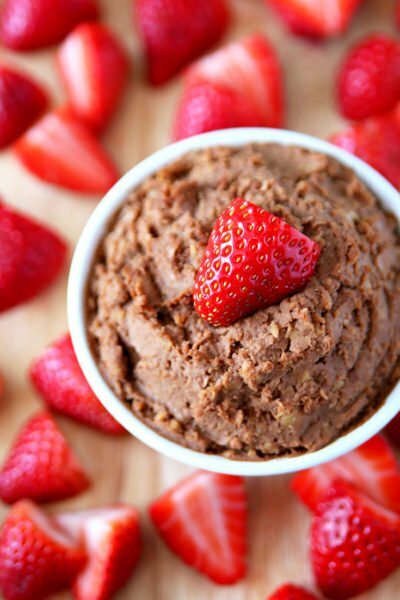 I’d like to make these tonight – I only have raw cacao powder in the house…whadd’ya think? suitable substitute for cocoa powder? I’ve never used it, so I’m not sure. Worth a shot though! Deb – Not in my opinion. But you could also use honey. Can I substitute any other types of flour ( almond, whole wheat..) ? Aarin – You can, but I would stick with gluten free varieties as that’s how this recipe is formulated. have you tried it with less maple syrup? half a cup sounds like a lot. Or could I use coconut sugar? Since I don’t have coconut flour, do you think sorghum flour or buckwheat flour would work instead? Sue – I’m not sure if the flavors would work on that. Plus, coconut flour is a very “thirsty” flour, so you might have to reduce the liquid content to replace it. My husband is allergic to coconut what else could I use? Murdette – An equal amount of butter should work. But I’m not positive what the outcome will be because I haven’t tried it myself. 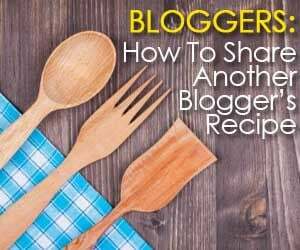 Can you post the changes to the recipe when butter is used? I’m not dairy free and would prefer butter over coconut oil. Thanks! Lauren – To the best of my knowledge, it would be an even switch. These look great! Looking forward to trying a grain-free brownie. Are there nuts in these? Just wondered since the picture looked like it. I love nuts in brownies. 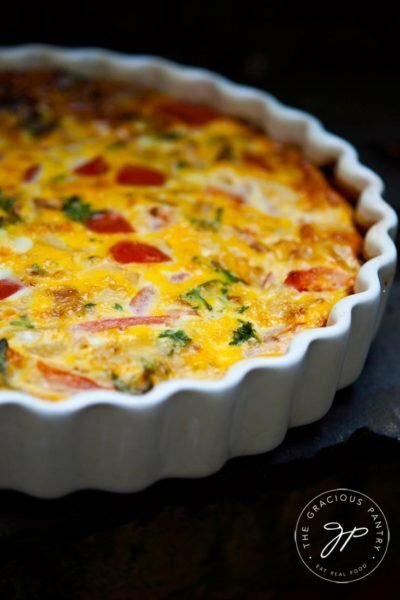 Jenny – I did not put them in the recipe, but you can certainly add them! Enjoy! So glad you liked and were able to amend the recipe! Not sure how I missed this post! It is a versatile recipe. I never make it the same! Rachel – I’m confused. Are you behind the Naturally Confused Mom site? I made these in a muffin tin and they have a nice cake like consistency that’s dense enough to pass as cake like brownies. I think they would be better with nuts and shredded zucchini, but this is a good base recipe I’ll be doing again, thanks. Latinavaquerita – Glad you enjoyed them! Great idea to make them in muffin tins! These came out more cake like than I expected. Thought they’d be more chewy like brownies. They were ok, but not sure I’d make them again. Elizabeth – Brownies, as I’m finding out, are a very individual thing. Everyone has a preference. I like mine a bit more on the cakey side. But I do have other brownie recipes that aren’t as cakey. Maybe one of those will work for you. 🙂 Sorry you didn’t care for these. Hi Tiffany. Thanks for your response. I agree–brownies are very individual. I plan on trying some of your other recipes. I enjoy your blog! I made these this morning and they were pretty good, even my 3 boys liked them. They were very crumbly coming out of the pan, so they do need to cool completely. I used an 11 x 7.5″ pan and they were the perfect size. I think a 9 x 13 might be too big. Definitely will be making these again. Thanks! Could i sustitute the coconut flour for almond flour? Jenn M – I wouldn’t coconut flour soaks up a TON of liquid. Almond flour seems to soak up almost nothing by comparison. I’m sorry if someone has already asked but where can I buy coconut flour? Jessica – Many health food stores carry it or you can order it from Amazon.com. Hi – Can white rice flour be used? Also is white rice flour bad? I’m gluten free. Sarah – Just because rice is brown doesn’t mean it has gluten in it. No more than white rice. But white rice is very processed and not clean. Melisa – I haven’t worked a lot with oat flour, so it’s hard for me to say. I’d have to create a recipe that uses it to be sure. Sorry, wish I could be more help. I made these tonight for dessert. I only had about half the amount of cocoa powder I needed, so I put in chocolate peanut butter powder. My kids think they are amazing! Thank you for this. Think they’d work with just egg whites? Five eggs is an awfull lot! Thank you!! Kristen – They might. But you’d have to double up. You’d need 10 egg whites. Isabell – I wouldn’t simply because coconut flour is an incredibly “thirsty” flour. The oat flour won’t absorb as much liquid and the batter may get too runny. You could try it if you cut down on the other dry ingredients, but at that point, it becomes one big experiment in measures. I do have two other brownie recipes on my site here if that helps…. I made these tonight for my mother and I. Followed the recipe to a T and they turned out deliciously! I absolutely love your page, everything I’ve ever made had been soooo good! Thank you so much and keep up the great work :)! I added chopped almonds and unsweetened coconut to mimic an almond joy. While I’m not vegan or gluten free or dairy free, these still look awesome and I’m always up for trying new ideas. Plus anything I can share that will help folks be able to enjoy a clean treat is good with me. 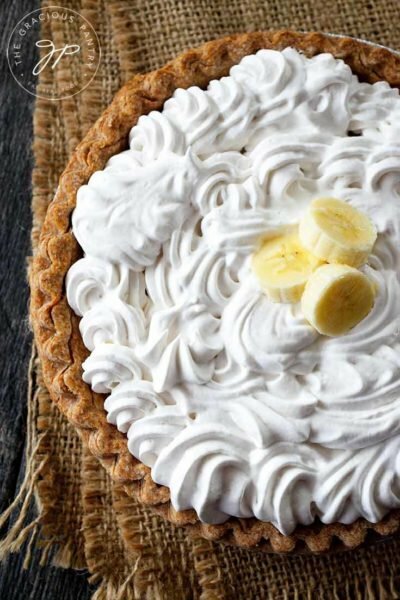 Can I use whole wheat pastry flour instead of coconut flour ? Tara – No, coconut flour is a very different animal. But I do have a different brownie recipe you might try instead. They are in the oven! I can already tell by licking the batter they are going to be great! I tried some avacado brownie recipe a few days ago and what a let down…I only trust your taste buds now lady!! Thanks for the awesome recipe!! Can I use gluten-free flour instead of coconut flour? Madison – You can, but you’ll have to use more of it. I don’t know what the conversions are, but coconut flour is very “thirsty” stuff. If you did equal amounts, you would have something closer to soup rather than batter. Page – You probably could, but you’d have to figure out how to make up the difference in the liquid. Page – Sure! Let me know how they turn out and what changes you made! Can i substitute the maple syrup with honey ?? Cherrie – Yes, but the level of sweetness will go up. I used cacao instead of cocoa. My brownies were very thin (1/4 inch) and cooked in less than 15 minutes. Not sure why. Figured i would stack a few and put some kind of filling in between slices. Wendy – It’s possible you used a bigger baking dish than I did. That would be my guess. As soon as I added the coconut oil, it hardened and everything clumped up. I had to throw away the whole batch. Can you recommend another oil? 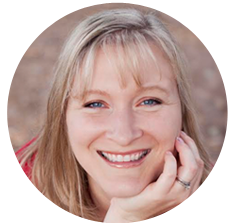 Jennifer – That’s okay! Just mix it the best you can and bake it. It will melt in the oven just fine. Wondering if I can sub agave for the maple sugar? Jill – You can, but it won’t be clean. Agave is highly processed stuff. Hi Tiffany! Just put brownies in oven. Can’t wait! I have a question about the blending. Do you mean by hand or with a blender, because when I added the coconut oil it started to solidify, making it hard to blend and lumpy. Is this normal for it to go into pan slightly lumpy?? Michele – That’s normal. Just blend it the best you can. You will definitely have lumps. But it’s nice if you can get those lumps broken up a bit. Ok Tiffiany! These are DELICIOUS!!! I left them in my glass pan, and put them in the fridge. I think they are even better cold. When the coconut oil solidifies, it makes me think that I am biting into choc chips. Ha Thank you for another great recipe!!!! Emily – Oh no!!! Something definitely went wrong there. Did you mix well enough? Made these today!! So Yummy!! Lauren B – I’m so happy you enjoyed it! These recipes all sound great however…. I hav a severe coconut allergy… so eating these clean recipes have been difficult. Is there anything you would recommend for switching out the coconut oil and coconut flour for? You have the patience of Job! I read many comments and noticed a lot of repetitive questions. You were very gracious to reply each time. I’m just urging folks to take a moment and read before they ask! Great, informative website. Glad I stumbled onto it! Definitely bookmarked. Is there a link to your cookbook? Thanks! Michelle – Haha! Thanks. 🙂 If you look up at the top at the main navigation area, you’ll see the “cookbooks” link at the top. Once there, you can filter by clicking on the black text for either ebooks or published books. Thanks! Hi do you have the calorie count on these brownies? I’m using them for my nutrition project and am citing you as a source! Geet – Sorry, no. You would have to plug the recipe into an online recipe calculator. MyFitnessPal.com has a really easy one. Good luck with your project! Hi there! I just finally tried this recipe today! I baked it for my husband for our Fathers Day dessert! It tastes yummy! I’m sure the kids will love this too! Thanks for sharing ! By the way, I shared it on my blog as well and linked back to you at learn2livelife.com. Hi! Can’t wait to try this. Do you have any sense for whether or not they would freeze well? These brownies are really good! I did melt my coconut oil before adding it to the batter and wound up added pecan pieces to the mix, too! Almost makes you think of an Almond Joy bar when eating them! Baked mine in a 9×9 for 30 min., which was perfect.